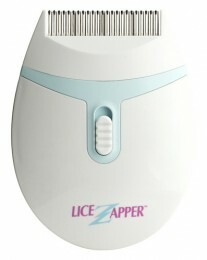 The FDA Cleared Epilady Lice Zapper is an electric comb that zaps lice dead as you comb through the hair.The Epilady Lice Zapper is our newest generation of electronic pest removal combs. Safe for people of all ages.It provides a safe, effective and chemical-free solution to a very common problem - lice.The Lice Zapper detects and kills lice on contact, while grooming the hair. The tight comb is electrically charged and releases a discharge that kills the lice without causing harm or discomfort to the human they are attached to! It is child-friendly, safe and easy to use, and very effective.